Danny Meyer does it again --- this time Roman-style. 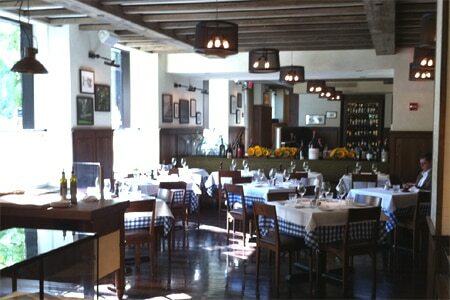 : The Danny Meyer empire includes this traditional Roman spot in the Gramercy Park Hotel. Walk through the always-bustling space (open for breakfast, lunch and dinner) done up in brown, tan and other muted tones and you immediately feel like you're part of something special. (The bay windows overlooking the park help.) The menu has offered classics like fried artichokes (bolstered by anchovy bread sauce) and tripe with pecorino and mint to start off the meal. Pasta dishes don't deviate from what you might find in a Roman trattoria: the bucatini all'amatriciana looks and tastes like it's straight from the banks of the Tiber and the ravioli al uovo is simple and understated, keeping to the basics of pasta and egg. But don't skip the suckling pig, the restaurant's namesake, which is an off-the-menu delight: the crispy skin gives way to a juicy interior that will have you thinking about it for days afterward. Still, for a Danny Meyer restaurant, there are missteps. At times, it seems too full to handle the number of customers. Overall, however, with the general consistency that comes with a Meyer operation and far, far more hits than misses, Maialino is a welcome option in the city's Italian dining scene.